Riding the Bell: Lehigh Valley Transit's Liberty Bell Route By Ron Ruddell CERA Bulletin 147 "In the newest Central Electric Railfans' Association publication, author Ron Ruddell chronicles the history of Lehigh Valley Transit's famed Liberty Bell Route interurban that ran between Philadelphia and Allentown. Known for its scenic line through southeastern Pennsylvania, LVT operated a fascinating variety of equipment from stately heavyweight interurbans to secondhand lightweight high-speed cars acquired from Ohio and Indiana. Portions of the line meandered alongside local roads or over city streets while other sections operated on private right-of-way with catenary and block signals on fast competitive schedules. A cut above many interurbans, the LVT even operated deluxe club car service on selected runs. 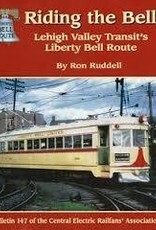 Noted transit historian George Hilton called the LVT's Liberty Bell Route the last "pure" interurban as it owed its existence exclusively to passenger traffic or express carried in interurban freight equipment. The reader will learn about the Liberty Bell Route's development, operations, colorful equipment, and also about the people whose dedication and effort managed to keep the line in operation until 1951. 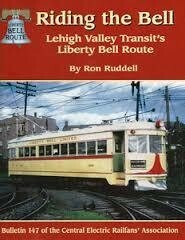 "Riding the Bell: Lehigh Valley Transit's Liberty Bell Route contains 264 pages with over 350 photos-80 of them in color-plus detailed color maps, car drawings, and a complete roster. Both informative and entertaining, Riding the Bell is a must read for both the serious transportation student and casual traction fan."